The moral of the story apparently is do not beam down with Captain Kirk unless he is going to get some strange Alien Woman. Somehow this compares to web analytics, but I sure as heck cant figure it out. In this fascinating and hilarious video interview, Matt Bailey explains how segmenting web analytics data before analysis can help a marketer figure out what is really going on with the various types of customers who visit a website. 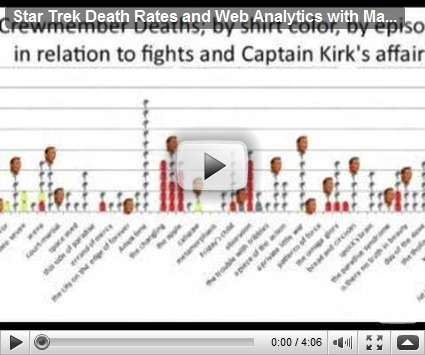 And that less red shirts dies when Kirk gets some. This entry was posted on Tuesday, March 30th, 2010 at 5:53 pm	and is filed under Personalities, Captain Kirk, Fun Stuff, Personalities, Tech Tips, Webmaster Tools. You can follow any responses to this entry through the RSS 2.0 feed. You can leave a response, or trackback from your own site.